Can you write five different Chinese characters simultaneously? 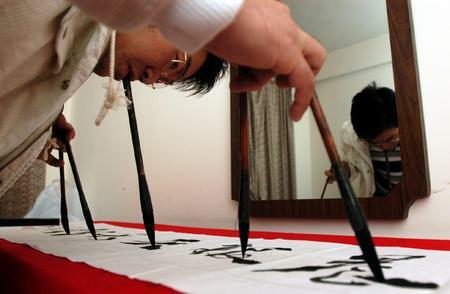 There is a calligrapher from China who showed his superb talent in writing five Chinese characters using five different Chinese brushes simultaneously. 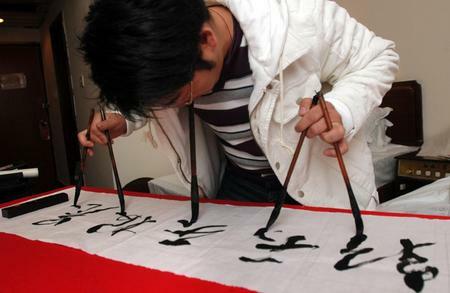 He held two brushes each using his hands and one brush in his mouth to write the five Chinese characters “晨报天天新”. This entry was posted on Thursday, December 7th, 2006 at 9:27 am	and is filed under Interesting Stuff. You can leave a response, or trackback from your own site.